Take a look at that photo. 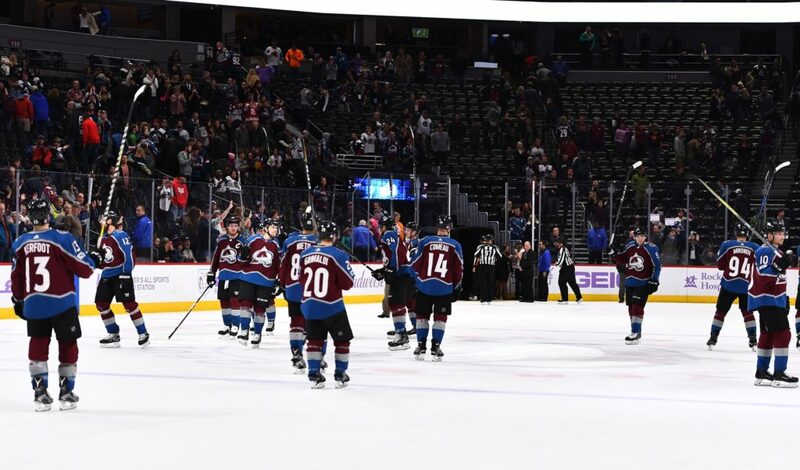 After Semyon Varlamov made a career-high 57 saves, the Avalanche was celebrating a 5-3 win over the Carolina Hurricanes at the Pepsi Center on November 2. With raised sticks, the Avs also acknowledged the crowd — what there was of it. Announced attendance that night was 12,048, and as announced attendances often do in endeavors that tally tickets distributed rather than bodies in the seats, that figure triggered “yeah, right” reactions. Yes, it was a Thursday night in November. Yes, it was against a lackluster opponent. And yes, the Avalanche was coming off an historically awful season, further shrinking the season ticket base and safety net. Now, in the wake of Colorado’s 3-2 loss to Calgary in front of an announced crowd of 15,738 Saturday night, the revived Avalanche’s average attendance of 14,860 through 10 home dates ranks 27th in the 31-team NHL. Last season, the Avalanche’s average for the full 41-date home schedule was 14,835, ranking 25th among 30. That’s a far cry from the franchise’s 487-game home sellout streak from 1995 to 2006, albeit the first four years in the smaller McNichols Arena and for a team among the NHL’s elite. Before anyone gets hot, bothered and defensive, this is not going to be one of those diatribes chiding consumers for not filling the seats. I don’t believe I’ve ever used the word “disgrace” about lackluster attendance. The marketplace rules. I always find it curious when folks wearing press credentials and getting in free whine about how others spend — or don’t spend — their entertainment dollars. So far this season, the Avalanche is drawing 84 percent of capacity. So we’re not talking about tarps draped over entire balcony sections or anything along those lines. For both the Avalanche and in pro sports in general, I’m actually amazed how well — yes, well — attendance has held up in a time of televised home games, HDTV, high ticket prices and all the other costs tied to attending a game. But the Avalanche is ahead of only Arizona, Florida, the New York Islanders and Carolina. The reboot and rebuild also is an attempt to get fans — Avalanche fans, not Blackhawks and Red Wings and Rangers fans — back to the Pepsi Center. The Avalanche’s instant success after the franchise’s 1995 arrival and long run among the league’s elite helped nurture a base, including fans following from afar, that hasn’t gone away. Even last season, there still was passion to go with the widespread disgruntlement and disaffection. Granted, many in Denver’s general sports fan constituency have become apathetic about the Avalanche. (Wake us when the Avs are winning again … and how do you think Paxton Lynch is going to do?) Yet I’m convinced that on the attendance front, this is more about fans being increasingly selective and discretionary in the down times than being completely driven off. And for those who belittle the Avalanche box-office success in past years as a bandwagon phenomenon, let me ask this: So? The entertainment business is about creating bandwagons. In hockey, that even can be at the United Center, which before the Blackhawks’ turnaround could seem a ghost town for NHL games in the early to mid-2000s. It’s also aggravating when Avalanche struggles at the gate are advanced as proof that “this isn’t really a hockey town.” The same folks never would dream of saying the Nuggets’ attendance downturn shows that “this isn’t really a basketball town.” Rather, NBA box-office downturns are portrayed as a savvy market refusing to patronize a bad product. There’s a business revenue component to all of this, of course, especially considering the Stan Kroenke-owned Nuggets ranked last in NBA attendance last season, averaging 14,470 through a 41-game schedule. Even in its terrible season, the Avalanche was a better draw. That has changed. Through 10 home games this season, the Nuggets’ average of 16,673 is 23rd in the NBA, and they are outdrawing the Avalanche so far. That’s a lot of unsold regular-season NHL and NBA tickets for Kroenke Sports and Entertainment. Both teams also offer discount packages and single-game, night-out deals that presumably would go away or be less common if the seats could be sold at full freight. There hasn’t been an NBA or NHL playoff game in the Pepsi Center since 2014. The absence of postseason revenue is painful for the KSE comptrollers and the ownership and missing the playoffs has a lag effect the next season. Because of arena capacities at the time, even in the final season of 41 sellouts, in 2005-06, the Avalanche’s maxed-out average of 18,007 left Colorado “only” 11th in league attendance. New arena construction since means that the Avalanche likely would be no better than 14th if it sold out every game. So that’s where the bar is. Cracking the top 10 would require sellouts here, plus unlikely sudden box-office crashes in a few of the sport’s hotbeds with bigger arenas. Since the end of that streak, the Avalanche has made the playoffs only three times and won only one series — the six-game, 2008 first-round defeat of the Wild. By 2008-09, the Avalanche had sunk to 26th in home attendance and the high-water mark since was ranking 19th in 2015-16. Otherwise, Colorado has been in the bottom third of the league, ranking from 22nd to 27th. The Avalanche goes into Saturday night’s game against the Flames with a 7-1-1 home record. So far, the biggest improvement since last season’s fiasco has been in the entertainment quotient. If the Avalanche’s revival seems genuine by Christmas, the box office will get busier.